I am Jade’s husband, Matt. Since many key parts of Jade’s experience giving birth are a blur for her and since she seems right now to be perpetually feeding Andi, we decided to give me a crack at telling our story of Andi’s arrival into our lives. After more than one doctor told us our baby would come early, and the last ultrasound indicated she might be more than eight pounds (which freaked Jade out! ), as Christmas approached Jade and I were anxiously waiting for something to happen. She was having contractions intermittently throughout the day, but nothing was happening even though Jade’s due date was January 1st. Finally, we scheduled with our doctor for Jade to be induced on the evening of January 5th and we resigned ourselves to waiting. And then, on Saturday January 3rd, we were reminded of the Yiddish saying, “Man plans and God laughs.” As we were eating a late breakfast, Jade got up, screamed, “Oh my God, Oh my God, Oh my God” and ran into the bathroom where her water broke just like in the movies, ie. with a big splash and a scream (and an Irish Jig by me in the background)! Jade, my dad, and I then frantically ran around our apartment gathering what we needed, including Jade’s hospital bag and 19 different pink baby outfits ;), and then rushed over to the hospital. As soon as we got to the labor and delivery unit, Jade and I said a prayer, and then began the waiting game. The nurse hooked Jade up to the monitors and we got acclimated to our delivery room. After the initial excitement passed, we started to sense that it was going to be a while. Thankfully, Jade’s two sisters Niki and Tori, and best friend Kelsey, and my dad, all came to the hospital to sit with us and provide support. Jade had steady contractions for about 6 hours, and then the pain became unbearable and she decided to get an epidural. While it helped with the pain, it caused Jade to start shaking uncontrollably, which seemed to be almost as bad as the pain of contractions. Unfortunately, Jade was not dilating quickly, and around 12:00tshe spiked a fever and Andi’s heart rate jumped, both signs of infection. The doctor tried to get Jade’s fever in check, but ultimately was unable to and suggested we do an emergency C-section. As they were preparing to wheel Jade into the operating room, her parents arrived after a rushed 12 hour drive from North Carolina and were able to give Jade a hug and kiss before she went in to surgery. Frankly, it all happened so fast at this point that I think Jade and I did not really have much of an opportunity to get scared or anxious as were going in. The surgery started at 2:00 and Anderson Rose Scott was born at 2:06 am, weighing 6 pounds 14 ounces (so much for the predictive value of late term ultrasounds!). 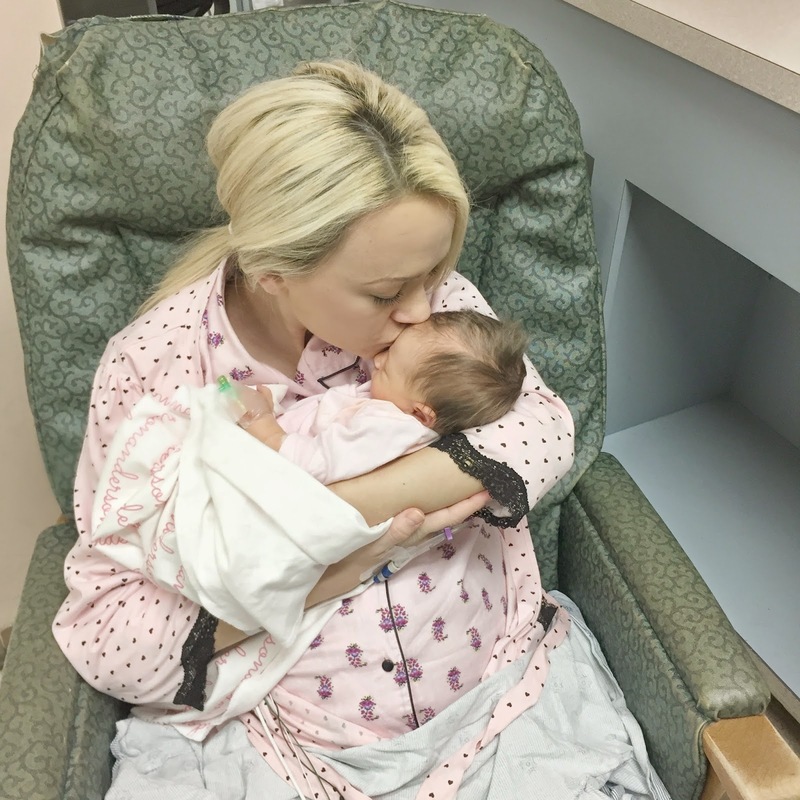 I could tell that the physical pressure of pulling the baby out was incredibly painful for Jade, and my heart ached to see that. Then Andi was delivered, and she was not making any sounds, which obviously scared us. Turns out, she had Meconium and her cord wrapped around her neck twice. The doctors and nurses were able to get Andi breathing, and after cleaning her up, brought her over to Jade’s face to say hello for the first time. Jade immediately started crying tears of joy and said, “I never thought I would have a baby of my own,” which naturally caused me to choke up and cry. Candidly, after everything Jade (and to a lesser extent I) went through to get pregnant, my happiest moment was not so much seeing the baby for the first time but seeing Jade see the baby for the first time. The nurses then rushed Andi to the Neonatal Intensive Care Unit and Jade was transferred to our recovery room where we waited for an update on Andi. About 3 hours later, I was allowed to visit Andi in the NICU and was incredibly relieved to find out she was doing good but would need to stay in the NICU for observation and IV antibiotics for a few days. As I walked back to Jade’s recovery room to update her, here is how I felt: https://vine.co/v/OnHjg757MMg . What followed over the next few days were countless visits to the NICU with Jade to see and feed the baby, breast feeding acclimation, struggling with carpal tunnel syndrome, and rounds of antibiotics for Jade, washed down by hotdogs and other pregnancy forbidden foods. Turns out Jade got an infection in her placenta from her water breaking and being in labor for such a long time. Luckily it was on Jade's side of the placenta and not on Andi's. Jade got SO swollen. Looking back it was funny but at the time Jade was so worried about it she was constantly asking the nurse if it was normal. She literally looked like she had on a fat suit from the knees down. Thankfully that went down pretty quickly after being home. On Wednesday, January 7, Jade dressed Andi up in her finest outfit and we took her home. We are excited and hopeful and nervous as we embark on this new chapter in our lives, but at this time we are more than anything thankful. We are thankful to God for the blessing that Andi is and that she is healthy. We are thankful for Dr. Fahey and Dr. Noel, and the labor and delivery nurses, and the recovery nurses, and amazing NICU doctors and nurses at Broward Health Medical Center. We are thankful to our parents, siblings, and friends for their love and support. And we are thankful to you, Jade’s blog readers and Instagram followers. As strange as it may sound, your support and interest in our IVF process and pregnancy was an incredibly meaningful and powerful positive force in our lives. So, we thank you. Many more pics to follow . . . . I am so thankful Matt was able to write this for me because it does all seem like a blur to me. I get so emotional just thinking about it. Things did not go how we expected them to but I wouldn't change it for the world. I am just so happy that after everything we have a happy healthy baby that I love more then anything. I am planning on starting to blog again soon. It had been so nice to be able to take time to just enjoy and spend time with Andi. It goes by so fast. Also I am still struggling with carpel tunnel so that has made it hard to do a lot of things and we are still just trying to get in a routine and figure everything out. Also recovering from a c section has made things a little more challenging then I expected. But I am really starting to feel better. I just can not wait to be able to lift things. Hopefully by next week I will have some outfits posted. Thank you all so much for following along and for all of the support. It means so much. And I can't wait to share her newborn pictures soon! Congratulations on your beautiful little girl! I am sure she will be just as fashionable as her mother. Congratulations! Andi is absolutely gorgeous! Hoping for a speedy recovery for you Jade! Amazing! Reading your story I can see God's hands all over it! Thanks for sharing! Little Andi is absolutely adorable!! Blessings on getting into your new role as a mother. It's so much fun! Congratulations. What a sweet version of the story from Matt. Take all the time you need Jade, we will be waiting for you when you return. All the best to you and your sweet family. This was so incredibly sweet to hear from your husband's perspective and I found my eyes welling up multiple times! I'm so happy for you, and am thankful God has blessed you with sweet Anderson Rose! Beautiful baby and story. Thanks for sharing! Beautifully shared! All the best to your lovely new family! Oh wow!! This is such a touching post! Congratulations and may you be all happy, healthy and blessed!! Congratulations to you both! Anderson (Andi) is beyond beautiful. Enjoy these days - the internet isn't going anywhere:) They fly by. Congrats! I love the name you picked! Oh my gosh...she is precious!!! Congratulations Matt and Jade! She's beautiful! Wow! It definitely didn't go according to plan (seems to happen a lot!) but I'm so incredibly happy and thankful you have a healthy baby girl and you're doing well! Hope you're feeling better and enjoy every moment. Your story is beautiful and your baby is perfect! I don't know you but I can always tell from your blog that you have a wonderful heart and you deserve this happiness. God bless you and your family. I seriously almost cried reading this! Such a sweet POV and one that isn't shared often. That must've been an insane experience and congratulations on your beautiful baby! http://trendkeeper.me ... Showering at the gym and what blog success means?! This is such a beautiful story. Andi is the most precious baby I've ever seen! So glad your doing better, and NO rush getting back into blogging! Congrats to the both of you! congratulations!!! our stories are similar, with the infertility struggles and then labor resulting in a rushed/emergency c section. the recovery was SO hard. hang in there - you are doing FABULOUS mama! congrats to you and your proud husband :) she's so beautiful! ps. you have to spill where you got your cozy robe/jammies! that makes labor look a whole lot more soothing! I couldn't help but tear up reading a daddies view of the whole deal. So sweet and I hope you get to feeling better and into a good routine soon. Congratulations Jade she is beautiful! So happy God has blessed you with the most precious gift, and that you are both happy and healthy! Congratulations! I dont know if you read any of the comments but this is exactly what happened to me. I had a fever of 105 and had emergency c-section. I was so swallen, i couldnt even look at myself. I really cant believe you back to wearing your normal jeans. I came across your blog while googling for pregnancy blogs. My wife was expecting but, sadly, she miscarried a few weeks ago. I was touched by Matt's account of the birth of your lovely baby. I can only imagine what it feels like for you both. I hope we can experience the same someday. My wife also has red Hunter boots which I love when she wears them, which is not as often as I would like because we live in hot Brazil. I just happened to read your comment as I posted mine. I am very sorry to hear about the miscarriage. I paused and said a prayer for you both. What a beautiful story! Congratulations Jade and Matt! Congratulations! May you both enjoy each and every moment of the next chapter of your lives as parents! What a beautiful baby girl, and a beautiful name to match!! Congrats and welcome Baby Andi!!! Loved the post by the new Dad! Great post! Loved hearing your story from the "dad's perspective." Best wishes to you & your new little family!! Its so nice to hear what it is like for others as I am gearing up to have my first child as well!! Thank you so much for the story and update. You both are so lucky to have each other as life partners. The baby is beautiful!! This was just perfect from dad's perspective! You two are such an inspiration. Faith in God and faith in each other bring miracles. Anderson Rose is a gorgeous name for such a beautiful baby. I couldn't be more thrilled that you are a family of three now! Can't wait to have your blog resume, Jade, but you take all the time you need to recover and enjoy these precious moments. Thank you both so much for sharing Andi's birth story. I'm over here getting emotional reading this, I can't even imagine how it must have felt being a real part of it. I am so happy for your new journey being new parents and hope to learn a few things to prepare me in the future :) Hoping your recovery is going well Jade! Andi's birth story was beautiful. I read your previous post about your IVF struggles and I prayed for you. I have been following you on Instagram and it is so wonderful to see how great everything turned out. God definitely does laugh when we try to make plans. But just like this time God's plan is often more amazing than we could even imagine. God bless you and your family especially your baby girl! Congratulations! She is beautiful and I wish you both the best of luck. Congrats and prayers for thhe family!, she's beautiful. Congratulations! That is a lovely text! I crying with this words.... I can fell so much love in this history! Welcome AndI! I just live you right now! I wish you all the best.... For you jade, Matt and AndI! Jade.... Just relax now and appreciate your babie, we your flowers u de stand and respect this time! Congratulations! I wish you all the best of luck. She's perfect. Congrats!! Your husband did an awesome job of telling the story of how your baby girl entered the world :) I'm not a mother but hope to be one very soon so I can't even imagine how thrilled you and your husband must be :) all the best! Your mister did an amazing job with sharing this amazing story with us, one day Andi will be looking back on this and reading and see how much she was loved from day one :) Massive congratulations to you and your family! This is such an inspiring post as my husband and I look to start our family soon. So honest and true, congrats! It is a thing of joy to finally have my husband back after leaving me and our two kids for 3 years. My husband was the best thing that have ever happen to me, he was so caring and understanding till he met a girl called Sophia and ever since then his attitude change towards me and our kids and he became what i never imagined. He keeps late night with Sophia and most time he won't came home. One day he told me he needs a divorces, i weep and was heart broken, there was nothing i could do to stop him because his mind was made up and went on with Sophia. 2 days ago as i was on the internet seeking for help i came across so many testimonies of people on how Doctor Ororo has help them so i contacted him for help also and to my greatest surprise 12 hours later My husband came back to me begging me to accept him back. contact Doctor Ororo for help via email: (doctorororospelltemple@outlook.com) or website: (http://doctorazuaworldofpowerfulspell.webs.com) or via WhatsApp: (+2348068784784)!! !